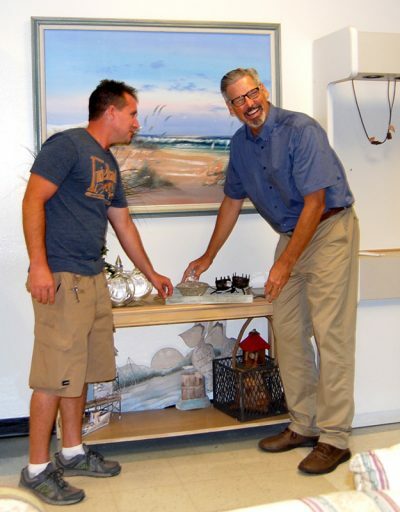 Doug Bork, left, director of the Manatee YMCA Nifty Thrift Store, 627 10th St. E., Palmetto, and Sean Allison, president/CEO of Manatee YMCA, check out some of the items for sale at the Y’s new venture. For more than 40 years Manatee YMCA has been operating its three branches and helping the Manatee County community with social services, but opening a thrift store will be a new kind of venture for the nonprofit organization. And Doug Bork, director of the newly opened YMCA Nifty Thrift Shop, 627 10th St. E., Palmetto, is confident it will be a success. “We expect a good turnout the first day,” Bork said the week before the ribbon-cutting on Thursday, Aug. 10, and Grand Opening on Saturday, Aug. 12. The ribbon-cutting, which starts at noon, will be celebrated with refreshments and raffles. And from 11 a.m. to 5 p.m. on the Grand Opening day, there will be food, inflatables for children, prizes, vendors and discounts. The store has a large selection of clothing, furniture, baby and children’s items, books, artwork, electronics, sporting goods and a lot more. Sean Allison, president/CEO of the Manatee YMCA, said the organization needed to find another source of funding to expand its services. “We have a great donor base, but need to supplement those donations so we can help more within the communities, such as Pride Park,” Allison said. The Manatee YMCA has taken on the job of providing services to Pride Park, a southern Manatee County neighborhood trying to overcome crime and poverty. The Y’s Pride Park programs are run in community centers and area churches, but there are plans to construct a building to serve the community. Generally, the Y’s funding comes from membership dues, donations, and grants, but more sources of revenue were needed for this street-level mission, Allison said. So the organization’s leadership did some brainstorming, studies, and a business plan, and decided a thrift store would be the way to go, he said. The Manatee YMCA Nifty Thrift Store, 627 10th St. E., Palmetto, opened Thursday, Aug. 10, with a ribbon-cutting ceremony. He said YMCA’s in other cities have operated successful thrift stores, and his team drew on their experiences. Allison said the Palmetto location was picked because there is a lot of traffic along U.S. 301 and is in a busy area. The 9,000-square-foot building was formerly a urology and dialysis office and has been vacant for several years. Allison was confident the thrift store will be a success in generating needed funds, but he also believes the venture will benefit the YMCA members as well as the community. And the members proved that by bringing their donated items to the three branch locations, which were then delivered to the thrift store for processing. “We’re very happy with their support,” Allison said. He also said the thrift store was a way for the community at-large to get involved in helping the YMCA fulfill its mission. “Some people don’t know about all the charity work the Y does,” Allison said. The YMCA not only provides social activities for its members, such as various types of classes, fitness centers, and swimming pools, but it also has social service programs that reach out into the general community. Bork, the thrift store director, said they will be reaching out to other charity organizations and churches in the area. “We want to serve people right in our neighborhood,” said the Florida State University graduate. Bork has experience in thrift store operations, having been a manager for The Source Church thrift stores, a Christian-based charity. “The Y’s mission and mine are the same,” he said. The bright and cheery atmosphere of the thrift store was created with the hard work of all the new employees, said store manager, Jill Motherway. 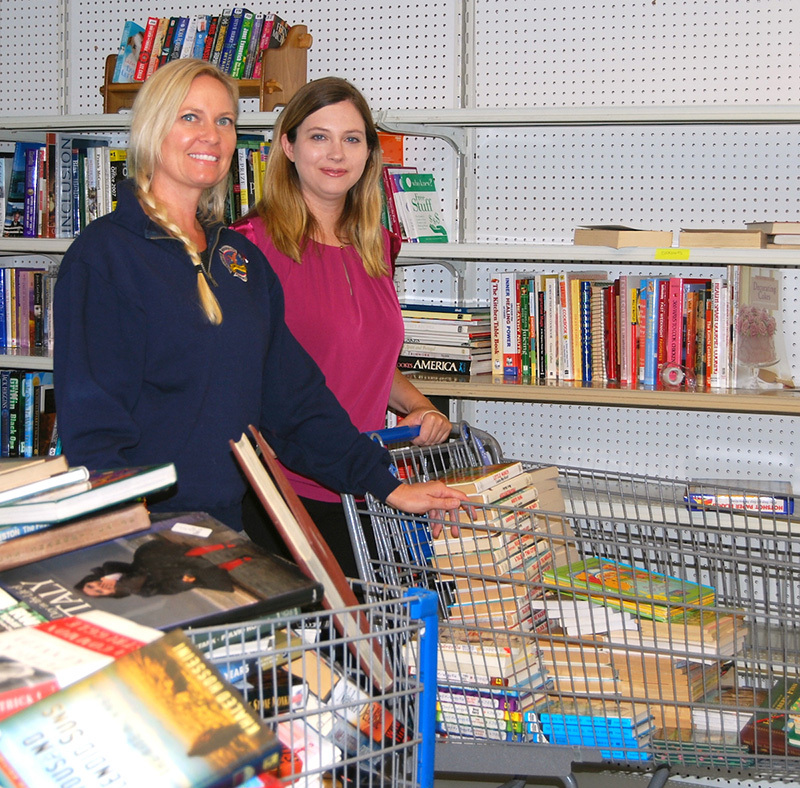 Jill Motherway, left, manager of the Manatee YMCA Nifty Thrift Store, 627 10th St. E., Palmetto, and Crystal Rothhaar, director of marketing and communications for the Manatee YMCA, check out some of the hundreds of books that are for sale at the thrift store. They spent weeks sorting, cleaning and pricing thousands of items to be put on shelves and racks. Motherway was very proud of the area around the bookshelves that was created. Motherway said they researched how to price the items. “We went to other thrift stores to see what were fair market prices,” she said. “Also, we looked online to see what some items are selling for. “We don’t want to over price, but we want to make enough to pay expenses and generate funds for our programs,” Motherway said. The hours of operation at the Nifty Thrift Store are 9 a.m. to 7 p.m., Monday through Saturday, and 10 a.m. to 6 p.m. on Sunday. Donations can be dropped off at any of the YMCA branches in Bradenton, Lakewood Ranch, or Parrish, or at the thrift store. Local pickup and delivery of large items is available by calling 941-212-4652. For more information about the Manatee YMCA or the Nifty Thrift Shop, call 941-212-4652 or visit www.manateeymca.org.